Whilst China's economy steams ahead (11% growth but with the odd hiccup), it's internet community follows closely behind. At the going rate of an additional 8 million users per month (or 131,000 per day), China is due to overtake the US total of 215 million users by the end of January 2008 (today, in fact!). (19 Feb 08 - correction: US still leads with 225 million, who of course spend much more online. In its latest report, the China Internet Network Information Center (CNNIC) claims that the number of users has surged in the last six months from 162 million at the end of June 2007 to 210 million at the end of December 2007. (Is this the 21st Century version of the Great Leap Forward?). Interestingly 40% of this growth (29.17 million) came from what they call "the rural areas". I guess this means that the hinterland is finally catching up. CNNIC also believes that about 16% of the Chinese population now has access to the Internet, compared with a global average of 19%. Not surprisingly, given that China now has over 500 million mobile subscribers, mobile access to the internet has skyrocketed 63% from 17 million in June to 50.4 million in December. 34% of users access from Internet cafes, most of them (74.8%) having high school education or below. 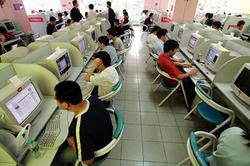 Internet cafes are more popular in the rural areas, with 48% of rural users going to internet cafes (网吧). The most popular service is online music: 86.6% of netizens listen to music via their computers, followed by IM (81.4%), online movies (76.9%), online news (73.6%), search (72.4%), online gaming (59.3%) and email (56.5%). If compared with previous report, the usage rates of online music, IM, online movies and online gaming all increased significantly, while the usage rate of online news decrease from 77.3% to 73.6%. 23.5% of users have their own blogs or spaces, that is about 49.35 million bloggers. The fist thing people do online is to chat on IM (39.7%), followed by reading news (20%), playing games (9.3%) and searching (7.4%). Note that a large proportion of Chinese Internet users go online just to chat or play games. In China, instant messaging is much more important than email, especially for users aged under 25. Interestingly, the report said that 48.3% of people trust online news from portal sites, while only 31.4% will trust posts in blogs or BBS (bulletin boards). For BBS, Mobinode just published an excellent post on the Chinese BBS phenomenon. 35.4% users published posts in blogs or BBS. 12.7% people uploaded movies while 10.4% uploaded short video clips.